Having searched the marriage records I found a Thomas Shannon who married Bridget Farrall on 8th August 1868; I acquired a copy of the marriage certificate which states they were married at the Roman Catholic Church Facit according to the Rites and Ceremonies of the Church of Our Immaculate Mother and St Anselm Facit in Rochdale. 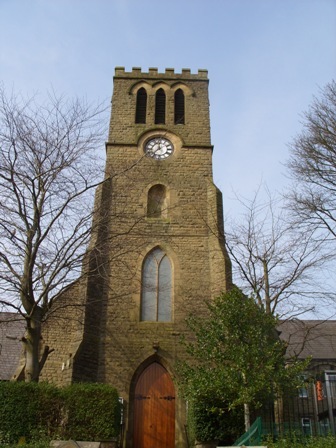 The church is in John Street in Whitworth. There are various reasons why I think this is my great grandparents: the first is that on the 1911 census, Thomas and Bridget Shannon are down as having been married for 44 years, which ties in with the Rochdale wedding. The second is that in the 1861 census there is a Catherine Farl (with an Irish accent, Farrell would sound like Farl) living in Millgate, Spotland; she is a widow, aged 40, born in Ireland and is living with her two daughters, Ann, aged 21 who is a cotton rover and Bridget aged 17 who is a cotton drawer; both were born in Ireland. Millgate is less than one mile from Facit which is where Bridget Farrell and Thomas Shannon were married. This seems too much of a coincidence. Catherine's older daughter, Mary, was married in 1856 and would probably have lived in Blackburn. The third reason, by a very circuitous route, is that his father's name is Michael. 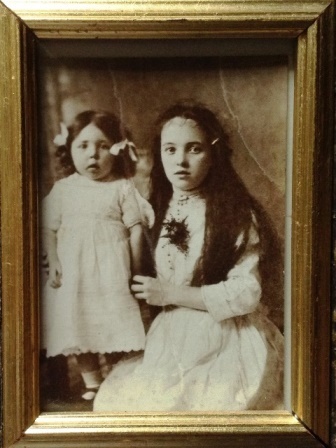 My cousin Barry has a photograph of his mother, aunty Kit, with her cousin Lucy Shannon. It is via this connection that I have come up with our great grand-father's name being Michael. The results of a search for the marriage of Bartholomew Shannon and Bridget Walsh came back with 6th April 1871 in the Roman Catholic Chapel of Achonry, Tobercurry, Sligo, in the presence of Pat Barrow and Mary Keenane. Bartholomew's father is called Michael and is deceased but was a land holder; Bridget's father is Pat and is also a land holder. Bartholomew is a widower. Bartholomew is living in Leitrim: there are several places called Leitrim in Ireland, but it seems likely it will be Leitrim Village which is 22 miles from Dohern which is where Bridget is living at the time of their marriage. On the 1911 census, my Thomas and Bridget Shannon are living at 2 Edward Street in Darwen, Thomas is a retired scavenger for the council (road sweeper), he was aged 69 years whilst Bridget was 64. Thomas came from Sligo and Bridget from Mayo (these had been added by the enumerator in pencil). The census tells us that Thomas and Bridget had five children, but only three were alive: Mary Ann (Polly, born 1878), Catherine Alice (Kate, born 1882) and Bridget (born 1884). 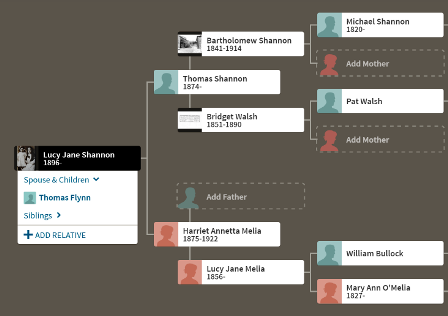 Having searched the births and deaths I have found one other child born to Thomas and Bridget Shannon, and his name was Michael (born 1875). Michael is there with his parents in the 1881 census and is aged 5 years; Mary Ann is 3 years old and Bridget's mother, Catherine Farrell, aged 60 years who is a widow and works as a domestic is also living with them. By 1881, the family have moved back to Lancashire and are living at 1 Haworth Court, Blackburn. Thomas is aged 38 and is a labourer in a furnace, he was born in Ireland; Bridget, his wife, is aged 30, and was also born in Ireland; their son Michael, is 5 years old and was born in Darwen; Mary Ann is 3 and was born in Halifax, West Yorkshire and his mother-in-law Catherine Farrell, is living with them; she is 60, a widow, was born in Ireland and works as a domestic. On 5th March 1882 they were living at 120 Moor Street, Blackburn, Lancashire, as this is where they lived when their son, Michael (on the death certificate Joseph had been added) died at the age of six years having had measles for 18 days followed by pneumonia for two days. His death was certified by G.A. Nelson. In 1891 they are still living in Blackburn but at 10 Shackleton Street. Thomas is 40 and a labourer, Bridget is 36 and a cotton weaver. Mary Ann is 14, Catherine 9 and Bridget 6. They are living with Michael and Harriet Banks. Michael is a painter. The census has all the adults down as coming from Meath in Ireland, Mary from Liverpool, Catherine and Bridget from Blackburn. It also suggests that Thomas and Bridget are boarders whilst the three girls are the grand-daughters of Michael and Harriet. I have wracked my brain for many years trying to resolve this conundrum but have been unable to answer it. I don't think Thomas and Bridget are related to Michael and Harriet, nor are their three daughters. By 19th July 1897 they are living at 14 Livesey Place, Darwen, as this is where their daughter, Mary Ann, got married from. Thomas died on 22nd November 1918 age 74 years, he outlived Bridget by two years. He was living at 12 Orchard Street, so must have moved after his wife's death. He died of arterio slerosis; cerebral anaemia; convulsions; and sudden death (seizure). His death was certified by E.A. Field and was registered by his daughter, Mary Ann Harwood of 3 Essex Street, Darwen. Bridget died on 21st June 1916 and was living at 6 Back Duckworth Street (not too far from Edward Street). Bridget was 65 years old and died of acute bronchitis and exhaustion. She was certified as dead by Geo. A. Thompson and the death was registered by her daughter, Mary A. Harwood who lived at 11 Essex Street, Darwen. God, how sad! Mary Ann (1878-1961), or aunty Polly as she was known by, married Michael Harwood at St John's, Darwen. 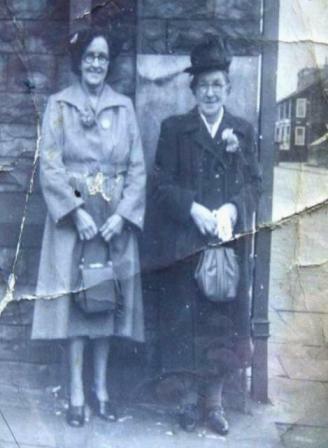 Here is a photograph (1940's) of Mary Ann with Bridget at the top of Kay Street where aunt Polly lived (about three quarters way down on the left hand side - I remember visiting her as a child. In fact, I recall that her house appeared dark and smelt of gas - this is because she still had gas lighting). Mary Ann's first child, John Thomas Shannon, was born in 1896 at 14 Clarke Street, Heywood, Lancashire. There is no father's name on the birth certificate. It would seem likely that when she got pregnant Mary Ann was shipped off to Heywood to have the baby - the informant of the birth is a Thomas Shannon. It is possible this is a relative. It also, perhaps, adds to the likelihood of the marriage of Bridget Farrall and Thomas Shannon in Rochdale as being our Bridget and Thomas if Thomas had family already living in Rochdale (Heywood is midway between Bury and Rochdale). Mary Ann and Michael went on to have six children, Betsey Alice (b. 1899); Mary (b. 1904); Jane Ellen (b. 1906); James (b. 1910), William Henry (b.1911) and Kathleen (b. 1917). But the 1911 census says that two of their children had died so I can only assume these were Jane Ellen and William Henry, although I cannot find them in the Lancashire BDMs. Here is a photograph of my grandma Bridget Shannon when she is about 44 years old: grandma is at the back, left; aunty May, her daughter, is at the back, right. In front of grandma is Bessie Richardson, who is Betsey Alice's daughter; then my mum, Bessie Ward; then Betsey Alice Richardson (my grandma's sister Polly's daughter) with my cousin Tommy on her knee. Catherine Alice (1882-1950) Catherine married Christopher Holden in 1904. In 1911 they were living at 2 Charles Street, Darwen. Christopher was a blacksmith's striker working for the corporation and Catherine a cotton winder. According to the census they had been married six years and had six children born alive but four of which were dead. I have been able to find Catherine Alice who was born in 1904 but cannot find a death for her; Mary Ann was born in 1905 and died the following year; Thomas was born in 1910 and died the same year; and Doris was born in 1911 and according to the records was registered as having died the following year but given what it says in the census it seems likely she died in 1911. The census tells us that Henry Holden was born in Dover, Kent, in 1902 and we know that Christopher was in Dover in 1901 but Catherine Alice did not marry Christopher Holden until 1904. I cannot find a Henry Shannon. So this is a bit of a mystery. Their daughter, Louisa, was born in Darwen in 1907 and was 4 years old in the 1911 census. According to Lancashire BDMs, Catherine died in Darwen in 1950, she was 68 years.